Following pressure and protests organized by local high school students, a plan to establish a new segregated high school for Bosnian Muslims was postponed. Students in central Bosnia and Herzegovina return to school this week, but not with the usual nerves that accompany back-to-school season. This year, high school students in the small, medieval city of Jajce are returning with a newfound sense of purpose and empowerment. Over the summer months, the students organized protests that successfully pressured the local assembly in the Central Bosnia Canton to postpone its plans for a new segregated high school teaching only Bosniak (Bosnian Muslim) students. This proposed measure would extend a policy of ethnic segregation, already implemented in Jajce’s elementary schools, to the high school level. 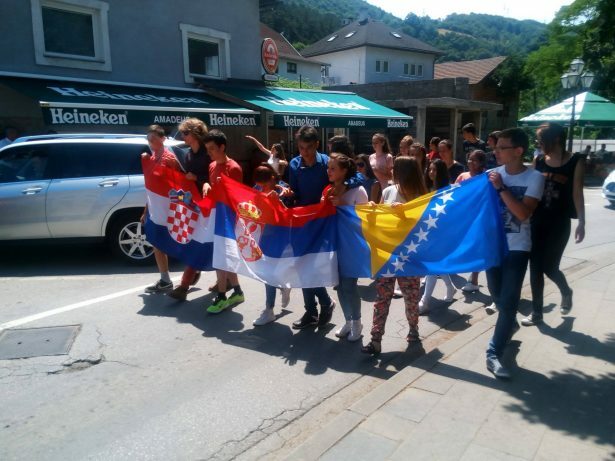 On July 8, an ethnically-mixed group of nine high school students marched through the streets in Jajce, carrying three national flags to represent the three constituent nationalities in Bosnia and Herzegovina: Bosnian, Croatian and Serbian. Through a coordinated effort organized by local student council groups, students gained support from media around the country, who elevated their message against division at the national level. In the wake of the students’ protest, the cantonal Ministry of Education announced in August it would not move forward with the plan to convert the Nikola Sop secondary school into a school only serving Bosniak students, separating them from their Croat peers. Although the plan has been stalled for the time being, officials could still attempt to divide the existing high schools in Jajce or reintroduce the proposed project to build another school in the future. The combination of the students’ direct action, the elevation of their action by national media outlets, and high profile support of the students by international organizations all discouraged local political leaders from further pressing the issue this coming school year. Beharic said that politicians who had originally seen the measure as a way to win support before the upcoming October elections realized that the positive media attention to the students’ action might lose them votes instead of gaining them support. Despite this encouragement from international institutions, Sehic admitted that most of his teachers did not openly support the students because they felt unable to express their opinions freely on the matter. The director of one high school supported the students, allowing them to meet and organize in the school, Sehic said, but the second high school’s director did not support the action. Having endured violence and ethnic cleansing during the Bosnian War of 1992-1995, Jajce’s schools employ a controversial educational policy called “Two Schools Under One Roof” — a measure practiced in roughly 52 schools throughout Bosnia and Herzegovina. Intended as a temporary way to bring kids from different ethnic groups into the same school building after the war, these schools keep students divided both physically and intellectually. The two “schools” have different class times and are conducted in different parts of the building. Some even have separate entrances, and breaks between classes are scheduled at different times to keep students from interacting with each other. Kids are taught different curricula based on their ethno-national identities, learning different lessons in subjects like history, geography, religion and language. The proposed school in Jajce would separate Bosniak students from their Croat peers, yet the stated goal of the initiative was to help preserve Bosniak identity by providing Muslim students a chance to study the Bosniak national curriculum. Until now, secondary schools in Jajce only taught the Croat national curriculum, which places more emphasis on the geography and history of Croatia than Bosnia and Herzegovina. Students’ report cards are marked with the coat of arms representing Herzeg-Bosna, used to symbolize Bosnian Croats, but perceived by many as a Croat nationalistic symbol from the war. Beharic said the initiative was a ploy for politicians to gain votes in the upcoming October elections in Bosnia, a plan that backfired when political leaders realized the extent of grassroots opposition to the policy. He also claimed that young activists in Bosnia are often accused of being paid or manipulated by more powerful actors. Despite the attempts to discredit the students, Beharic said this marks a victory for Bosnian youth, who are constantly told they cannot make a difference in the problems plaguing the country’s dysfunctional political system and stagnant economy. Young people in Bosnia and Herzegovina face a difficult set of realities: The country faces numerous interconnected issues, from a dysfunctional political system with three rotating presidents, to a stagnant economy propped up by remittances, loans and foreign aid. Youth unemployment in Bosnia hovers around 60 percent, one of the highest recorded rates in the world. These dim economic prospects have caused Bosnia, and the Balkan region as a whole, to experience a dramatic “brain drain” of educated youth leaving their countries to seek employment abroad. The fact that such a small group of students were able to impact a decision of the cantonal government shows that young people hold more power to influence Bosnian society than they might think. According to Beharic, it also offers a chance for them to create change in Bosnia instead of simply leaving the country. Samir Agic of the Youth Center cautioned that students must maintain pressure or their victory will be short-lived. “The voice of young people from Jajce was very strong and had a successful impact — for now,” he explained. However, he said if students do not continue organizing in the future, ruling nationalist leaders will continue pushing for more division. “If there is no [effort] to eliminate this political interest, they will keep doing it,” Agic said. Marko Barisic, an activist in the divided city of Mostar, said the success of youth in Jajce can motivate other young people around the country to organize against divisive policies and the nationalistic political interests they serve.